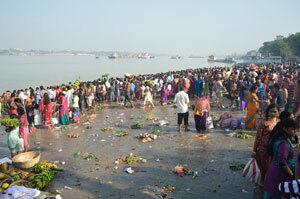 Chhat Puja (Chhath) is a Hindu festival of ancient times. It is dedicated to Surya, the Sun God, and Chhathi Maiya. It is observed in the month of Kartik (October/November) of the Hindu calendar. The festival is observed over four days. Progress, well-being, and prosperity are promoted. Symbolizing the god of life force and energy, the sun is worshipped. It is a restricted holiday- government and businesses are open. The performance of Chhath Puja for Surya, the Sun God, allows requests to grant certain wishes and thankfulness for life on earth. Sun worship is believed to cure disease and ensures longevity to family and friends.